This Item is a Pre-Order and will arrive on: Wednesday May 03rd 2017 ! MAR172810 - From K'NEX. 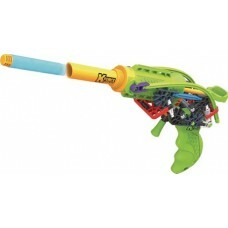 Build your own customizable blaster with the K-5 Phantom! Fires up to 75 feet! Set includes K'Nex rods and connectors plus special parts to create your blaster: 1 blaster chamber, 1 quick fit grip, 1 preload ring and 3 foam darts. Compatible with the entire K-Force Build and Blast line.